The Air Force ties with the Coast Guard as the hardest service to join. The Air Force gets more volunteers than they have slots for which they are recruiting. That allows the Air Force to be more selective when accepting applicants than the other services. The number of slots available varies from year to year, but it is always a small number compared with the Army and Navy. 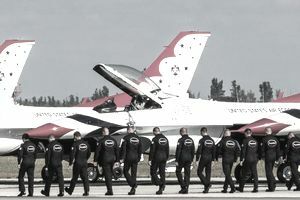 You will be competing with many others who are looking to join the Air Force. With advances in technology, the Air Force requires far fewer folks to operate and maintain their weapon systems. This can result in a decreased need for recruitment, or even downsizing, varying from year to year. The Air Force requires a minimum ASVAB score of 36 for high school seniors or graduates to enlist, but your chances are much better for acceptance if you score a 50 or better. If you hold a GED rather than a high school diploma, you will need a 65 AFQT (overall score) to qualify. Typically, only one percent of new recruits are allowed to enlist with a GED and must wait for GED applicant slots to become available. Like the Coast Guard, the Air Force approves far fewer medical waivers and criminal history waivers than any other service branch. The Air Force says that even an excessive number of traffic violations in a year can impact your eligibility. In most cases, drug use is a disqualifying factor and the Air Force encourages sobriety. The Air Force accepts very few prior service applicants each year. Usually, in order to enlist, prior service applicants must already be qualified in an Air Force job that the Air Force considers critically undermanned, or they must qualify for, and agree to enlist in a special operations job, such as Pararescue or Combat Controller. If you are a parent, you should consider the restrictions on enlistment. You would need a waiver if you have legal, physical custody of more than two children who are under age 18, but the limit is three children. A single parent who does not have custody must sign Form 1328, Statement of Understanding for Single Member Parent Having Dependents in the Custody of Another agreeing they will not seek custody after enlistment. Another consideration is that the Air Force has strict restrictions on tattoos, brands and piercings. They are not completely disqualifying, but they must not have objectionable content or cover more than 25 percent of any body part. The Air Force requires a professional appearance and does not consider tattoos to be compatible with it.